Here’s a fact about content marketing that’s actually shocking. 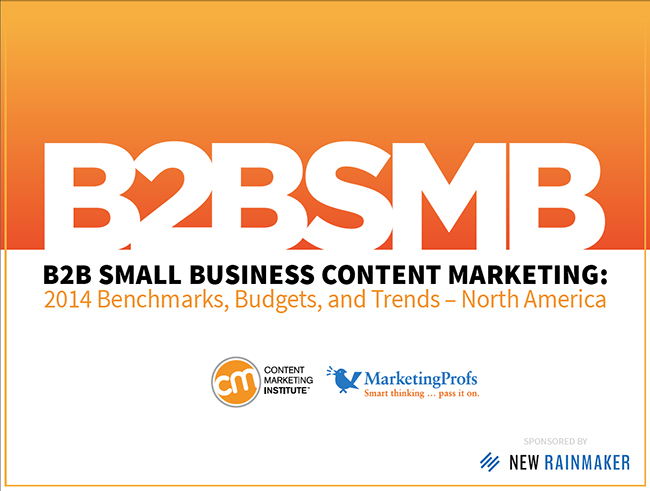 The 2014 benchmarks, budgets, and trends study by Content Marketing Institute and MarketingProfs (sponsored by our own New Rainmaker) is out, and it includes a number of surprising findings. Most notable is this: There remains a wide gap between the number of small business B2B marketers using content marketing (almost all of them) and those who believe their content marketing efforts are effective (less than half of them). That’s right — 55% of small business B2B marketers using content marketing believe that their efforts are, at best, having zero impact. Something is clearly missing. What so many small businesses need more than anything is … a plan. When you dig into the study’s findings, the lack of confidence makes more sense. Only 48% of respondents to the study said that they even have a content marketing strategy. The other 52% either do not have a strategy or are unsure if they do. Keep in mind, 94% of respondents said they currently engage in content marketing. Is it any wonder, then, that confidence is low? While these numbers sound shocking (and they are) they do not signal the end of the world. Confidence is actually on the rise, and a viable content marketing strategy is the prescription to continue that trend. The 2013 version of this study found that only 34% of respondents thought their content marketing efforts were effective. So this year’s 45% number is a substantial increase. It suggests that more planning and resources are going into content marketing efforts — including having a documented strategy, having someone vested with overseeing that strategy, and more money spent on content creation. As the study shows, if you want to be good at content marketing, then you need to invest the time and resources to do it right. You also need to choose the right channels. Did you know that for B2B small business marketers, case studies are more effective than white papers? Or that LinkedIn is better than Facebook and Twitter? Or that SlideShare is second to only one other platform in terms of how its effectiveness is rated by those who use it? The study breaks down how all of the different channels rank in effectiveness. It’s mission-critical information when you’re charting your own content marketing course. You can download Content Marketing Institute’s free report by clicking here: 2014 Benchmarks, Budgets, and Trends-North America. And if you’re a small business marketer in need of a viable content marketing strategy, we’re teaching and demonstrating one right now at New Rainmaker — free of charge.